The data is in. Digital Marketers have been warning clients that Google’s push towards paid advertising, especially on mobile devices, is likely to have an effect on organic results and we have the numbers to show it. 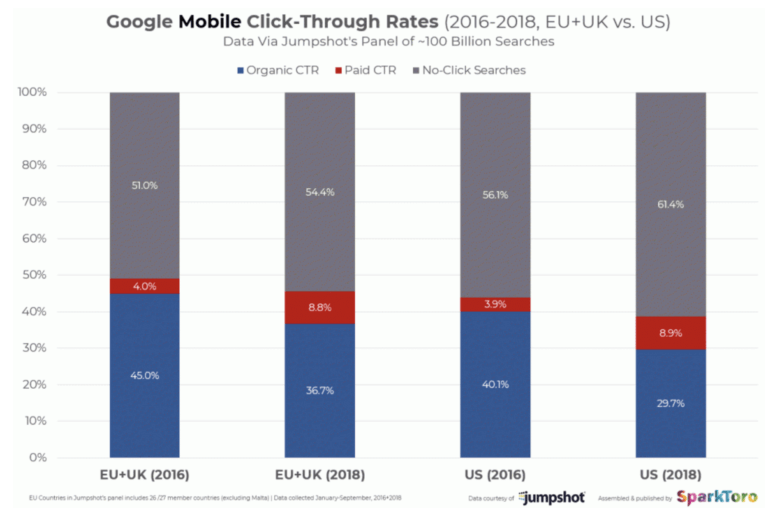 According to Search Engine Land and SparkToro’s Rand Fishkin and Jumpshot, Google organic click through rates on both desktop and mobile devices across the US and Europe have shown a slow decline since 2016. Why? More users are clicking on Google PPC ads or getting the info they need right in the SERPs and choosing not to click at all. Over the past year, Google has released dozens of new ways for its paid advertisers to take up more real estate on the search engine results pages, especially on mobile devices. Three headlines, two 90-character descriptions and a wealth of ad extensions mean that for a majority of searches, organic listings don’t stand a chance of showing above the fold but that may not hold true for Google PPC ads. As data has shown, it’s almost mandatory for brands to show at the top of a page above the fold to get the results they’re looking for. If organic listings are falling down lower and lower, it’s not a surprise that people aren’t even seeing them much less clicking. 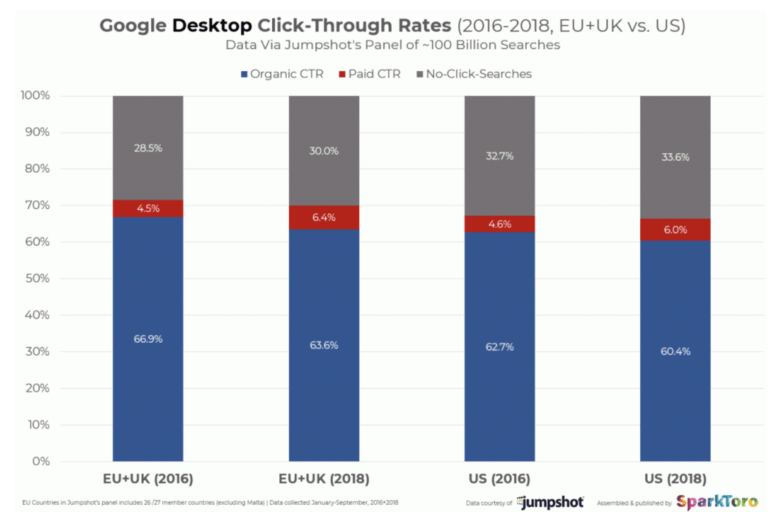 The graphics below from Jumpshot show a slow decline in Google organic click through rates on desktop with steady growth in Google PPC ads and no-click searches. Obviously, the numbers are much worse for organic listings on mobile devices for the reasons stated above. Paid Clicks have increased dramatically with a 3.9% CTR in 2016 to just shy of 9% in 2018. Outside of paid ads taking up so much more space on smartphones, Google has also used things like answer boxes and carousels to provide users with the best experience possible, usually leading to searchers getting the answers they are looking for without having to click deeper into a listing itself. For a local search, the average user may get up to 4 paid ads, a map and a local pack all above the first organic listings. If you’re simply looking for store hours, offers or a phone number, you don’t need to go any further. Another example is simple questions. Google’s answer box provides quick information in easy to digest answers. This is fueled by the most relevant organic listing, but gives a searcher what they need without any further research. Simple asks like assistance with math, definitions, brief overviews, cooking questions and how to’s all provide easy answers for users. What Does This Mean for Digital Advertising and Brands Looking for Organic Results? While it may seem irrelevant, a sound search engine optimization strategy is more important than ever. The last thing you need is to lose organic rankings and ultimately visibility because you’ve given up on pleasing the Google gods. Just because there’s a decrease in Google organic click through rates doesn’t mean your SEO efforts should fall to the back burner. Expert digital marketing partners can help your organic listings provide answers in those top ranked answer boxes when it’s relevant. It’s also important to remember that SEO and local should go hand-in-hand. Use search engine optimization tactics to get your business to the top of the local pack and provide the most relevant information there, and in the knowledge panel, to users. If you haven’t been thinking about a localized SEO strategy, now is the time. Outside of an organic strategy, advertisers can no longer put off taking advantage of Google’s Advertising options. It’s no surprise that Google is pushing people towards paid advertising, but it’s the reality we need to come to grips with. Now more than ever, the incremental value of paid and organic listings can be showcased to your clients. Google PPC ads are getting visibility and clicks – it’s in the numbers! Advertisers need to develop fully integrated strategies where paid ads, organic listings and local listings all work together. This is the case for brand too. We often hear from our clients that they don’t want to pay for branded advertising when their organic listings show up at the top. These numbers tell a different story. While organic visibility for your brand is and should be high, it isn’t always going to be at the top depending on the nature of your business. Numerous studies have come out over the years that show the incremental value of ‘owning the landscape.’ It’s important to test strategies to prove that these programs are effective and make sense for your brand. A simple branded campaign in Google Ads could show a higher return than organic listings alone even with the media spend factored in. It’s time to integrate. Test multiple strategies to get your brand in front of as many quality eyes as possible. 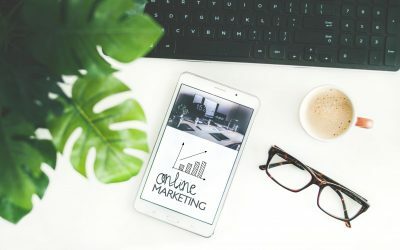 Organic alone isn’t going to drive site traffic, so if you haven’t already, get some Google PPC ads campaigns running and study your data to develop the most efficient digital strategy for your brand.